← [The FIRST Alive with Clive SuperStar Contest] I’m seeking $150,000 from Sponsors plus 303 Prizes. Wanna play? 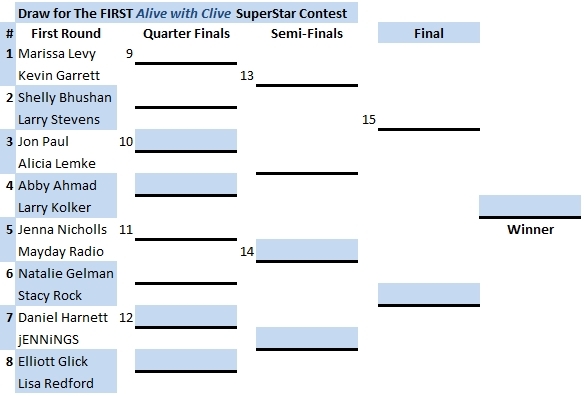 In my previous Blog post about The FIRST Alive with Clive SuperStar Contest, which you can see when you click here, I said that I will determine which Match will be the first to start by picking a number out of a hat. I have since decided, instead, that the first Match will be determined through votes cast for singer/songwriters who are in the Contest to be in The Alive with Clive Top 20. Yesterday, January 25, 2013, I updated the The Alive with Clive Top 20 Stats Page to reflect the most current order of totals of votes received by singer/songwriters who have been guests on Alive with Clive. After you cast a vote or votes for singer/songwriters to be in The Alive with Clive Top 20, you will see how many votes each singer/songwriter has received to date. In my first Blog post about The FIRST Alive with Clive SuperStar Contest, which you can see when you click here, I announced The Draw for the Contest. On the above chart you will see a reference to the term, “PTVI,” which stands for Pair Total Vote Increase. Those who are in the pair with the lowest PTVI will be in the first Match of the Contest, and those who are in the pair with the highest PTVI will be in the last Match in any round. Thus, for the purpose of determining the order of the Matches, what matters from this moment on until the start of the Contest and each subsequent Match is not how many votes to be in The Alive with Clive Top 20 a contestant has received to date, but only how many votes a contestant receives to be in The Alive with Clive Top 20 after January 25, 2013. 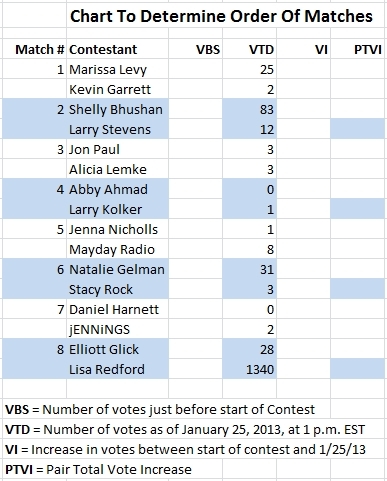 To determine the Match that occurs first, after I have obtained the prizes and sponsorship mentioned in my previous Blog post, on a date to be specified in the future I will add up the number of additional votes each pair of singer/songwriters in each Match has obtained since January 25, 2013. 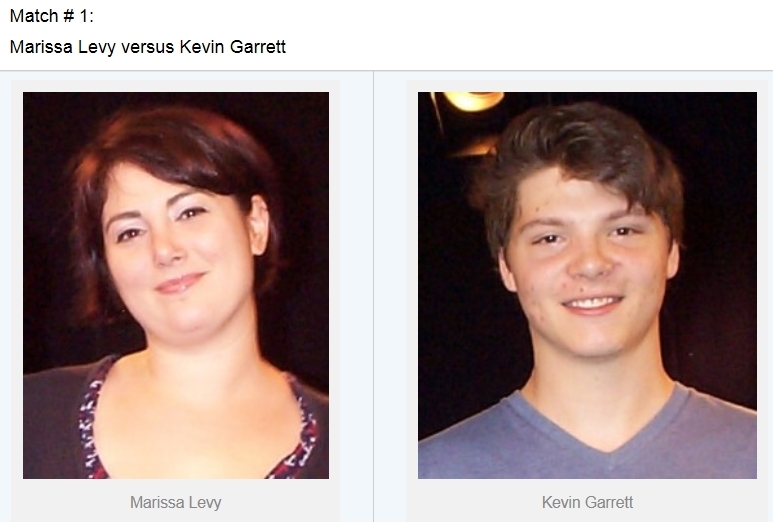 While the Contest is proceeding, voting for singer/songwriters to be in The Alive with Clive Top 20 will continue. After the first Match is over, I will then see which pair has obtained the least number of votes of the seven remaining pairs to determine the Match of the remaining seven that will be the next to occur. And this process will be repeated to determine the Match that happens next until all eight have been completed. The same process will be used to determine the order of the remaining Matches as well. Because this Contest is new and is just getting started, as the weeks go by more and more people are going to hear about it and will want to vote to win a Weekly Prize and Grand Prize, so the singer/songwriters whose Matches occur later will have more viewers. There is therefore an incentive for singer/songwriters to gain as many votes as possible to be in The Alive with Clive Top 20 not just between January 25, 2013, and the start of the Contest, but between January 25, 2013, and the start of every Match. For the purpose of determining the order of the Matches, therefore, the singer/songwriters who will be competing against each other will in a sense be partners to have their Match begin later rather than sooner. While votes to determine the order of the Matches will be taken into account to determine who is to be included in The Alive with Clive Top 20, voting to determine winners in each Match of the Contest will be conducted on a different Web page and the votes cast in the actual Contest will not be taken into account to determine who is to be included in The Alive with Clive Top 20. As of January 25, 2013, too, anyone who wants to vote for a singer/songwriter to be in The Alive with Clive Top 20 must be a Member of The Alive with Clive Global Community. You will find the link to vote for a singer/songwriter to be in The Alive with Clive Top 20 on the Dashboard for Members of The Alive with Clive Global Community after you have registered or log in as a Member with your unique username and password. After you have voted the first time, you will receive a link to vote in an email and may use that link in the future without logging in to The Alive with Clive Global Community. If you have already obtained the link for voting and are not yet a Member of The Alive with Clive Global Community, you may continue to use the link you have, but I recommend you become a Member of The Alive with Clive Global Community for free as soon as possible so you can participate in the Contest and enjoy other benefits of being a Member too. To become a Member of The Alive with Clive Global Community for free, click here. If you are one of the sixteen singer/songwriters who is a contestant in The FIRST Alive with Clive SuperStar Contest, now is the time to encourage your fans to vote every day for you to be in The Alive with Clive Top 20. This entry was posted in Alive with Clive Contests and tagged Alive with Clive, Alive with Clive Global Community, Alive with Clive Top 20, Alive with Clive Top 20 Stats, contest, Draw, Global Community, grand prize, Grand Prizes, Kevin Garrett, Marissa Levy, Match, Match # 1, Member, Order of Matches, Pair Total Vote Increase, prizes, singer/songwriter, singer/songwriters, song contest, sponsorship, The FIRST Alive with Clive SuperStar Contest, votes, weekly prize, Weekly Prizes. Bookmark the permalink.